Companions - Caspar David Friedrich | Since 1774. In Greifswald. Caspar David Friedrich’s most important companion and mentor during his time in Greifswald was his drawing instructor Johann Gottfried Quistorp (1755 – 1835). 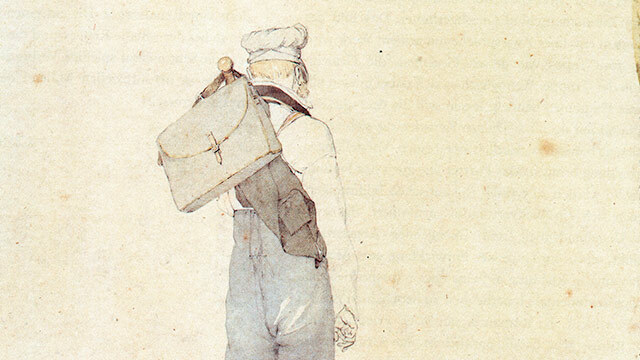 In 1788, Quistorp was awarded the post of academic drawing instructor at the University of Greifswald. He also worked as an architect and from 1789 on was responsible for the planning and construction of the City School in Greifswald, which today hosts the Picture Gallery of the Pomeranian State Museum. Quistorp’s teaching methods, such as taking his students on outdoor drawing excursions, had an important impact on Friedrich’s development as an artist. Friedrich’s precise study of nature is a key characteristic of his work. Through Quistorp, Friedrich met and was subsequently influenced by the poet and theologian Ludwig Gotthard Theobul Kosegarten (1758 – 1818). On the Isle of Rügen, Friedrich found an abundance of motifs and he frequently visited Kosegarten in Altenkirchen on his hiking tours. Kosegarten’s poetic descriptions of the beauty of the island’s scenery certainly had an impact on Friedrich’s work. The poet, who is probably best known for his sermons on the shore near the fishing village of Vitt, is one of the earliest collectors of the artist’s works. His collection comprises a number of the young Friedrich’s Rügen paintings. Since 1808, when Kosegarten was appointed Professor at the University and became pastor of St. Jacob’s church in Greifswald, he lived at Domstraße No. 9, directly opposite the church. Friedrich maintained contact with a number of other students of Quistorp’s even after he had left Greifswald. Among them were Carl Schildener (1767 – 1843), who later became Professor of Law at the University of Greifswald, the painter, writer and pedagogue Friedrich August von Klinkowström (1778 – 1835), the Greifswald painter and architect Christian Johann Gottlieb Giese (1787 – 1838) as well as Johann Christian Friedrich Finelius (1787 – 1846), who later became pastor at St. Nicholas’ Cathedral in Greifswald and the city’s superintendent. In 1801, Friedrich met Philipp Otto Runge (1777-1810), who was born in Wolgast and who, like Friedrich, became one of the most important representatives of north German Romanticism. In 1803, Caspar David Friedrich met and became close friends with the painter Georg Friedrich Kersting (1785 – 1847) from Güstrow. Friedrich had already made the acquaintance of the author and poet Ernst Moritz Arndt (1769–1860), who was born in Groß Schoritz on Rügen, whom he met during his studies in Greifswald. They kept in close contact throughout Friedrich’s time in Dresden, where Arndt also visited him in 1813. The bookseller Georg Andreas Reimer (1776 – 1842) was one of the most important collectors of Friedrich’s works. He visited Friedrich in Dresden on numerous occasions and acquired 36 of his paintings over a number of decades.